My good friend Martha blew through town yesterday to see a band play at a local bar. Luckily, we were on her radar and she and her husband joined us for dinner. We love them and super miss them since they moved away. It was SO good to hang out and catch up. And of course, take a ridiculous picture. Martha and I are incapable of taking a normal picture together. It’s always been this way and I am not sure why, but I love it. Martha is a psycho. I mean psychologist. And she is GOOD. She has been inside my head more than most people and still likes me. Sweet! That or she has a master plan that somehow includes kidnapping and/or dognapping as well as making off with my good jewelry. The jury is still out. My point is, we all need a Martha. We need that person who helps us relax, asks us the hard questions, yet is willing to get silly. 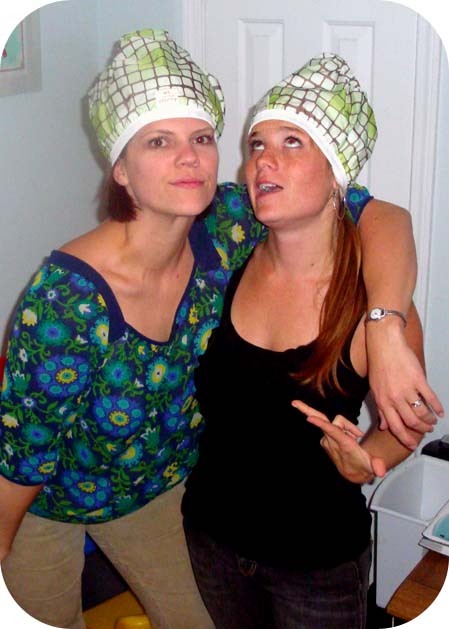 You know, that special someone who will pose for pictures wearing a diaper on their head. It’s a good thing to do. 9) When you have a diaper on your head you have to smile. It’s science. 6) When your kids grow up and say things like “MOM, you are SO lame!” because you won’t let them play World of Warcraft 27 online unsupervised with a 50 year old in Des Moines. You can be all, WHATEV! Have you SEEN my picture?? 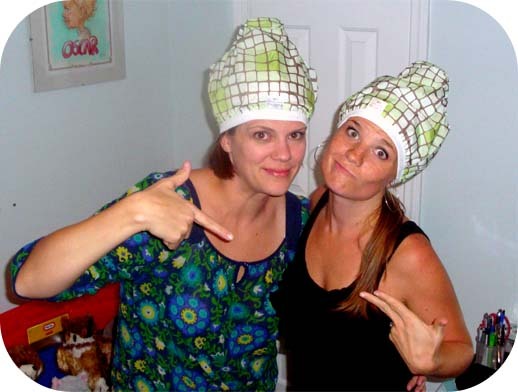 5) Having a waistband designed for a toddler squeezing your brain out of your skull really gives you an appreciation for lunch ladies and hair nets. 4) Husbands love this look and will ask why you don’t do this every day. 2) You will actually be in a picture instead of taking it. 1) Some day your baby will be out of diapers. And you will always wish you had taken that picture. Thanks Martha and Sam for a great evening and for always keeping it real with us. We love you! As long as it's a clean one, I will agree with every point on the list. You guys are a riot. LOVE your top 10 list! You are so funny!!! You only came up with 10 reasons? Jk- we had the best time last night. I loved watching you be an amazing mama to little Oscar.